A crater lake is a lake that forms in a volcanic crater or caldera. But could also refer to a lake form in an impact crater caused by a meteorite. This crater lake is actually called Crater Lake. It is the 9th deepest lake in the world with a depth of 594 meters (1,949 ft)! The lake partly fills a nearly 2,148 foot (655 m) deep caldera that was formed around 7,700 years ago by the collapse of the volcano Mount Mazama. It also appears in our deepest lakes list. Situated in the North Island of New Zealand. With a surface area of 616 square km and perimeter of approx 193 km, it is the largest lake by surface area in New Zealand. Lake Taupo is a crater lake that lies in a caldera created by a supervolcanic eruption which occurred approximately 26,500 years ago. According to geological records, the volcano has erupted 28 times in the last 27,000 years. A water-filled caldera in the Ecuadorian Andes. The 3 km (2 mi) wide caldera was formed by the collapse of this volcano following a catastrophic eruption about 800 years ago. The caldera has since accumulated a 250 meters (820 ft) deep crater lake, which has a greenish color as a result of dissolved minerals. Fumaroles are found on the lake floor and hot springs occur on the eastern flank of the volcano. Lake Pinatubo is the summit crater lake of Mount Pinatubo formed after its climactic eruption on June 15, 1991. It is the deepest lake in the Philippines at 800 meters (2,600 ft). Mount Katmai is located within the Katmai National Park in Alaska. It is a large stratovolcano, about 10 km (6.3 miles) in diameter with a central caldera about 4.5 by 3 km (3 by 2 mi) in area. The caldera was formed in an eruption of 1912 and is filled with a crater lake. The caldera rim reaches a maximum elevation of 2,047 meters (6,716 feet) and the lake has a depth of over 240 meters (800 ft). Mount Ruapehu is an active stratovolcano located within Tongariro National Park in New Zealand’s north island. Ruapehu is one of the world’s most active volcanoes and the largest active volcano in New Zealand. The deep active crater is between the peaks of two mountains and is filled with water, making it a crater lake. Located within a complex of nested calderas called Askja, Víti is a small explosion crater approximately 150 meters in diameter. It contains a geothermal lake of mineral-rich, sulfurous, opaque blue water, which is maintained at a comfortable temperature for swimming. Swimming in these craters is not a good idea because carbon dioxide can accumulate on top of the water, making the swimmer pass out and drown. Víti was formed in the eruption of 1875. The Blue Lake in Mount Gambier, South Australia is a large monomictic lake located in an extinct volcanic maar associated with the Mount Gambier maar complex. It is one of four crater lakes on Mount Gambier. Of the four lakes, only two remain, as the other two (Leg of Mutton and Brown) have dried up over the past 30 to 40 years as the water table has dropped. A lake and a popular tourist destination in the Ratanakiri province of northeastern Cambodia. 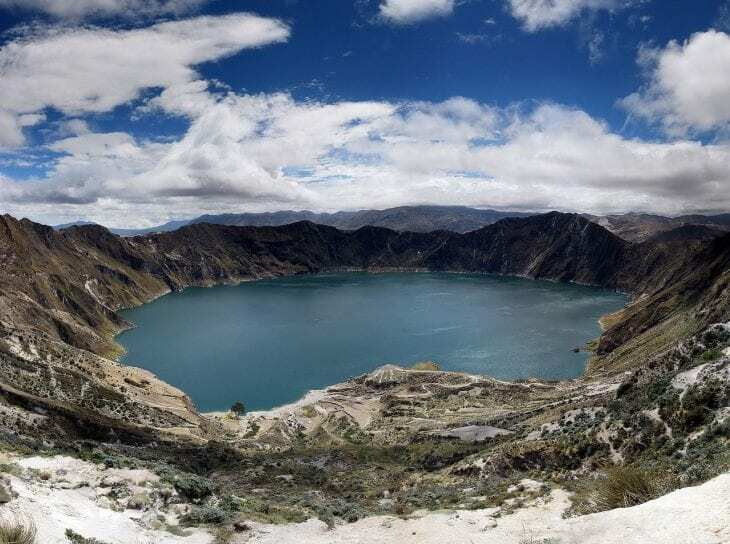 The beautiful lake occupies a 4,000-year-old volcanic crater. Due to the lake’s tremendous depth (157 ft or 48 m), its water is exceptionally clean and clear. The lake is almost perfectly round and measures 0.45 mi (0.72 km) in diameter. A crater lake on the border between China and North Korea. It lies within a caldera atop the volcanic Baekdu Mountain. The lake covers an area of almost 10 sq km (3.79 sq mi) with an average depth of 213 m (699 ft) and a maximum depth of 384 m (1,260 ft). From mid-October to mid-June, it is typically covered with ice.